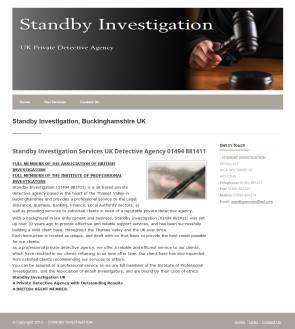 Standby Investigation is a UK private detective agency based in the heart of the Thames Valley in Buckinghamshire. We provide a professional investigation service to the Legal, Insurance, Business, Banking, Finance, Local Authority sectors, as well as providing investigation services to individual clients in need of a reputable private detective agency. With a background in law enforcement and business, Standby Investigation was set up over 20 years ago to provide effective and reliable investigation services. The company has been successfully building a solid client base, throughout the Thames Valley and the UK ever since. Your instruction is treated as unique, and dealt with on that basis, so as to provide you with the best result possible. As a professional private detective agency, we offer a reliable and efficient service to our clients, which has resulted in our clients returning to us time after time. Our client base has also expanded from satisfied clients recommending our services to others. You can be assured of a professional service as personnel are full members of the Institute of Professional Investigators, and the Association of British Investigators, and are bound by their code of ethics. Standby Investigation provides a range of investigation services. Standby Investigation is based in the Thames Valley, covering High Wycombe, Maidenhead, Staines, Slough, Windsor, Uxbridge, Bracknell, Aylesbury, Reading, Luton, Watford, Henley on Thames, Hemel Hampstead. We operate throughout the UK when investigations require this.